Villa Rica is often called “The City of Gold” because since 1826, people have been striking gold in the area, and it’s a reputation that the city maintains to this day. 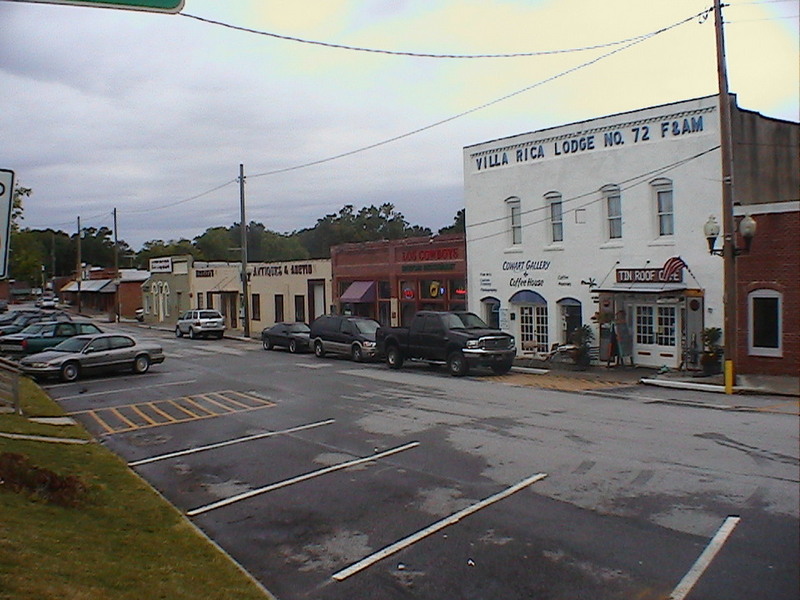 Villa Rica is also one of the fastest-growing cities in Georgia. From 2000 to 2010, its population increased by a whopping 238 percent. Along with that growth came an increase in local businesses, restaurants, and shops, turning what was once a small town into a thriving city just 35 miles west from downtown Atlanta. Villa Rica has very affordable real estate, which is partly why homeowners outnumber renters here 58 percent to 42 percent. Whereas the median home value for the United States is $184,700, the median home value in Villa Rica is just $139,700. The city’s rent, however, is more aligned with the national average, with Villa Rica’s rent averaging $989 to the nation’s average of $949. The most popular home styles here are the ranch and plantation. Transportation in Villa Rica is done almost entirely by way of car. There is no public transportation presence in the city, but there are several major roadways that travel through it. These include Interstate 20, U.S. Route 78, and State Routes 8, 61, and 101. City planners have recently proposed constructing the Gold Nugget Trail, which when completed will provide pedestrians and bicyclists an alternative option for getting around. Villa Rica is predominantly made up of Whites (52 percent) and African-Americans (34 percent). But there is a substantial presence of other races as well, including Hispanics, Asians, and people of two or more races, each accounting for four percent of the population, and another race and American Indian/Alaska Natives making up two percent and one percent, respectively. Villa Rica has eight percent more women than it does men and 25 percent of adults have earned a bachelor’s degree or higher. Age-wise, adults aged 35-to-44 and children under the age of 10 make up the two largest age groups in Villa Rica, each accounting for 17 percent of the total. The median household income in Villa Rica is $50,222, which is lower than the current national average of $55,322. Meanwhile, the median individual income is $27,103 in Villa Rica, compared to $27,419 nationally. Villa Rica currently has a higher than average unemployment rate at 6.5 percent to the national rate of 3.8. Dining out in Villa Rica never fails to deliver a tasty experience. This is especially the case when you go to Evans Barbeque, considered by many to have the best barbeque in West Georgia. At Gabe’s Downtown you’ll enjoy Cajun and Creole specialties, and for the best burgers in town, head to Jerry’s Gourmet Burgers, where the burgers are just as eclectic as the restaurant. For a great meal on the cheap, you can get authentic Mexican food at Los Cowboys II Mexican Restaurant for less than your usual fast-food drive-thru, or the best Asian food for the best price at Kong Long Restaurant. Those who love to hit the social scene at night will find plenty to love about Villa Rica. You’ll find good food, drinks, music, and pool tables at Stix Billiards & Sports Bar; a genuine Irish pub at the Irish Bred Pub; a charming wine and beer bar at Cherie Armand; and live music and all your sports bar staples at Cinema Tavern Reel Sports Bar & Grill. There are also several hip-hop dance clubs and chill lounges in and around Villa Rica, like Blue Mist Café, The Place Bar, Grill And Nightclub, and Jordan’s Lounge. Villa Rica is a history lover’s dream city. There are several noteworthy historic sites and landmarks here, including Wicks Tavern, the oldest commercial structure in Carroll County, the Pine Mountain Gold Museum, the Dorough Round Barn and Farm, and the Williams Family Barn, among others. The city also has two historic districts, one in the north and one in the south. Villa Rica also hosts several popular festivals throughout the year, including the Gold Rush Festival and the Thomas A. Dorsey Festival. Villa Rica is fast becoming an artistically inclined city, with the Villa Rica Arts Coalition spearheading the movement with its ArtFEST festivals and workshops, while the MILL Amphitheater is where you can catch concerts, comedy shows, and other events throughout the year. The Villa Rica Senior Center provides local seniors age 60 and over with a variety of activities, programs, and services designed to help them live more informed, heathier, and happier lives. Seniors can partake in daily activities like ceramics, card games, day trips, fitness classes, and more, and are also able to attend seminars about medical, financial, and other important issues. Residents of Villa Rica receive quality healthcare support and emergency medical services from WellStar Cobb Hospital and the Tanner Medical Center. Other nearby options include Higgins General Hospital to the east, and a variety of different medical providers in Inner Harbor to the west. Villa Rica is close enough to Atlanta to be convenient, but it is well away from the noise, traffic, and commotion of the big city. This is a residential suburb all the way, so it’s quiet, friendly, and comfortable, although it still offers everything you need, so you’re not feeling left lacking. There’s a lot to love about this historic town, which is why so many people have chosen to make it their home since 2000. Yes, people are still striking gold in Villa Rica, and you can too. Need to stay up-to-date on home trends information in Atlanta but don't have the time to Google it all? Sign up today for our FREE updates!